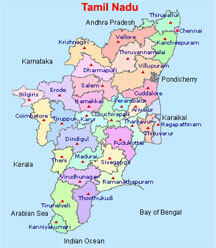 Tamil Nadu is the most urbanized state in India. The key industries of the state are heavy engineering and manufacturing-based companies and textiles. Tamil Nadu covers total land area of 130,058km2 and is divided into 32 districts which are: Ariyalur, Chennai, Coimbatore, Cuddalore, Dharmapuri, Dindigul, Erode, Kancheepuram, Kanyakumari, Karur, Krishnagiri, Madurai, Nagapattinam, Namakkal, Perambalur, Pudukottai, Ramanathapuram, Salem, Sivaganga, Thanjavur, The Nilgiris, Theni, Thiruvallur, Thiruvannamalai, Thiruvarur, Thirunelveli, Tiruppur, Trichirappalli, uticorin, Vellore, Villupuram and Virudhunagar. Its capital and largest city is Chennai. Tamil Nadu lies in the southernmost part of the Indian Peninsula and is bordered by the union territory of Pondicherry, and the states of Kerala, Karnataka, and Andhra Pradesh. It is bound by the Eastern Ghats in the north, the Nilgiri, the Anamalai Hills, and Palakkad on the west, by the Bay of Bengal in the east, the Gulf of Mannar, the Palk Strait in the south east, and by the Indian Ocean in the south. The region has been the home of the Tamil people since at least 500BC. Its official language Tamil has been in use in inscriptions and literature for over 2000 years. 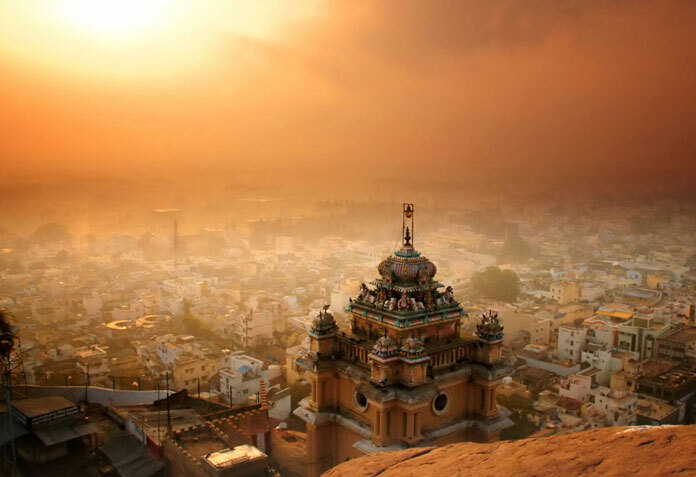 Tamil Nadu is home to many natural resources, Hindu temples of Dravidian architecture, hill stations, beach resorts, multi-religious pilgrimage sites and eight UNESCO World Heritage Sites.